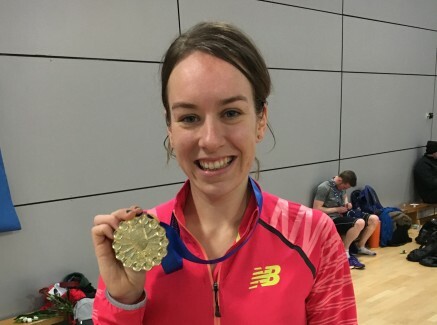 28th February 2016 – Steph Twell (GBR) added the British Indoor 3000m title to the 5000m outdoor title she won last summer with a confident and assured display at the World Indoor Championship trials. Having already secured the necessary qualifying standard in Glasgow last week Steph positioned herself near the head of the field as others went in pursuit of the time. After passing 1000m in around 3:01 the pace drifted to 6:05 at 2000m. Still sat comfortably in second, Steph decided it was time to make her move and went to the front and controlled the race from there. Gradually increasing the pace each 200m lap she moved away and was a convincing winner in 8:54.99 to secure her place on the British team for the Championships in Portland in three weeks time. On the first day of the championships Dina Asher-Smith (GBR) all but secured her place on the team by finishing second in the womens 60m, running 7.34 seconds in the heat , 7.16 seconds in the semi-final and 7.15 seconds in the final. Michael Rimmer (GBR) had an eventful weekend as despite winning his 800m heat by a distance he was subsequently disqualified for a lane infringement. Stepping up to the 1500m he made his way into the final with a smooth heat display but then was forced to drop out of the final with a recurrence of a back injury. On the roads in Puerto Rico Linet Masai finished fourth in the Worlds Best 10k. In a very tight finish that saw five women battling to the line Linet recorded a time of 31:56.